Trump’s dangerous plan to back the Sunni Arab states against Iran. The president wants America to take sides in the Middle East’s sectarian rivalry. That won’t end well. President Trump bids farewell before departing for Israel in Riyadh, Saudi Arabia, on Monday. President Trump’s maiden speech on the global stage, in Saudi Arabia on Sunday, has been described by commentators as the unveiling of a “Trump doctrine” on the Middle East. If this is true, it forebodes an escalation of war, not a road map to peace, and a shift in U.S. policy from soothing the region’s sectarian tensions to deepening its wounds. Trump himself has won praise by some for sticking to script (a tellingly low bar) and for shirking mention of “radical Islamic terrorism,” which he’d previously denounced as the root of all evil (though, at one point, he reverted, uttering “Islamic” instead of the script’s “Islamist,” a slip that a spokesman later attributed to exhaustion—an eyebrow-raiser, given that this was the first day on a more than weeklong whirlwind tour). But read closely, without a grading curve, the speech was by turns shallow, clichéd, and repellent. Even the few times when its authors approached a bold theme, they veered away, lest it soften the visit’s three main missions: to assure the region’s Sunni leaders that they can run their countries and oppress their critics with no finger-wagging from Washington; to wrap up a massive $110 billion sale of American weapons; and to declare war on Iran, or at least unabashed hostility toward its regime. No discussion of stamping out this threat would be complete without mentioning the government that gives terrorists … safe harbor, financial backing, and the social standing needed for recruitment. It is a regime that is responsible for so much instability in the region. I am speaking of course of Iran. … For decades, Iran has fueled the fires of sectarian conflict and terror. It is a government that speaks openly of mass murder, vowing the destruction of Israel, death to America, and ruin for many leaders and nations in this room. … All nations of conscience must work together to isolate Iran, deny it funding for terrorism, and pray for the day when the Iranian people have the just and righteous government they deserve. It would have been one thing, had Trump combined this jeremiad against the Sunni leaders’ common enemy with a righteous call on those same leaders to acknowledge and halt their own contribution to the problem. Trump did not drop so much as a hint about the Saudis’ longtime funding of the Wahhabi clerics who have supplied holy heft to al-Qaida and other jihadi movements; the role of Saudis and Egyptians in planning and executing the 9/11 attacks; the Saudis’ exploitation of anti-terrorist rhetoric to excuse the mass killings in Yemen (a campaign that the United States has aided and, with the massive arms-sales agreement, will now be intensifying); or, of course, its oppression of women or its total clampdown on dissent. 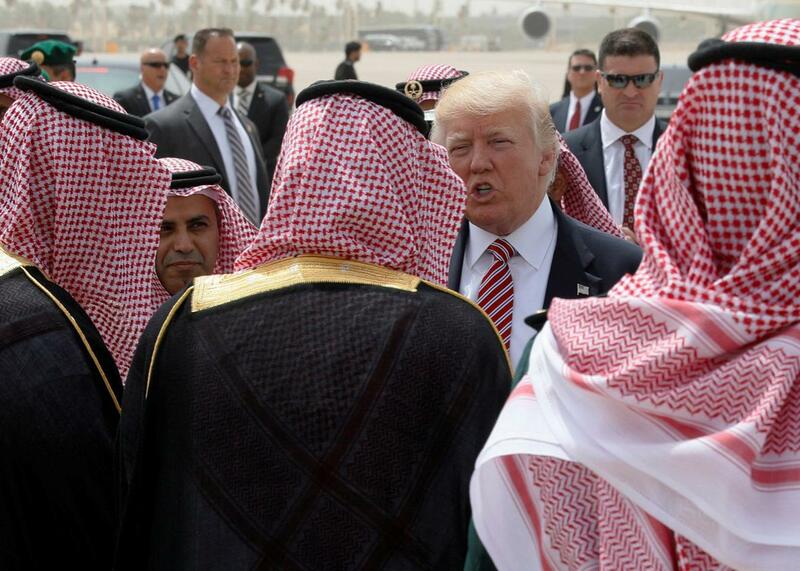 Trump’s broadside against Iran specifically, combined with his vague condemnation of terrorism in general, provided his Sunni hosts with the nudge-and-wink they needed to continue defining terrorist in a manner of their own choosing. In their formulation, Shiite extremists are terrorists; Sunni extremists, because they are fighting Shiites, are anti-terrorists. Trump said and did nothing to call them out on this deceptive logic. Many have noted the irony that Trump delivered this speech to an audience of monarchs on the same day that thousands of Iranian men and women took to the streets to celebrate their re-election—by a wide margin and with a high turnout—of a president, Hassan Rouhani, who campaigned on a record of reintegrating their country with the world. Iran is not an American ally. Rouhani’s power is subordinate to that of a council of repressive mullahs; much of the economy is controlled by the Islamic Revolutionary Guard Corps, which arms and assists radical militias throughout the region. However, as Laura Secor relates in her magisterial book, Children of Paradise: The Struggle for the Soul of Iran, the country’s politics are rife with power struggles. Rouhani and his foreign minister, Mohammad Javad Zarif, are players in the most vital of these struggles—whether Iran grinds on as a bastion of revolutionary zeal or joins the community of nations. Its ascent (and now survival) reflects a growing awareness, even among some of the mullahs, that the former course leads to doom. President Obama tried to engage the factions in this struggle, offering incentives and rewards for movements along the latter path (hence the 2015 nuclear agreement and the relaxing of certain sanctions) while, at the same time, containing Iran’s expansionist tendencies. Obama boosted arms sales and other forms of assistance to Saudi Arabia, Egypt, and the Gulf states in exchange for muting their opposition to the nuclear deal (which they saw as a sign that America was abandoning Sunnis and embracing Shiites). Trump’s speech heralds a shift to old norms, plus some: He is telling the Sunnis that America is back in their court, this time with no strings attached. There will be no need to tolerate our overtures to Iran (because there won’t be any) or our lectures on human rights (ditto). On a broader level, Obama tried to soften the Sunni-Shiite tensions in the region by ignoring or transcending them—pursuing what he saw as American interests, irrespective of the local regimes’ ancient, twisted outlooks. Some U.S. interests put us on the side of Shiites, others on the side of Sunnis. Obama hoped that he (and other outside powers) could form alliances that would move away from, and gradually override, the region’s sectarian rivalries. This approach didn’t work out. Sectarianism proved to be much deeper than he’d appreciated. Even the common enemy of ISIS did little to foster cooperation. The sects’ fear and loathing of each other remained the dominant force, and Russia’s intervention—which, a decade earlier, might have proved productive—only intensified the conflict, as Vladimir Putin put his alliance with Syrian President Bashar al-Assad above any impulse for regionwide stability. The Trump administration has abandoned Obama’s probably futile diplomatic efforts, but throwing in totally with the Sunnis—on all levels, including militarily—isn’t likely to make things better. The speech describes this new policy as “principled realism, rooted in common values and shared interests.” This is worse than empty boilerplate. In the context of the speech, and of Middle Eastern politics generally, the phrase “principled realism” means nothing: What realism is he accepting? What principles is he advancing? It is not remotely clear. And while the United States has “shared interests” with the Sunni royal families, we in no way have “common values.” To say that we do is to throw a dreadful message to the rest of the world—and to make a mockery of principles and of realism.